"Consumer Shipping / Parcel Scale Comparison Test"
After many requests by consumers, we finally agreed to do a consumer shipping scale comparison. These scales are very popular purchases on the Web and represent a significant percentage of the digital scale market. There are 4 primary scales that fill the market, so we had samples of all four sent to us for full testing and comparison. All four scales have "similar" specifications, a similar size, and all four operate on both batteries or AC Adaptor. Other than these basics, the four scales are actually very different from each other. The highlights of our tests are as Follows: The best scale overall was the Ultraship 50lb, it has the most features, the best modes, best accuracy and is overall a more intuitive design than the other scales. Second place was a tie between the Generic 30lb scale and the Generic 35lb scale. While the 35lb scale had a HOLD feature that was not available on the 30, the 30 had a larger LCD and reads in 2g increments (the 35 reads in 3g). Last place goes to the Escali 33. The Escali 33 was clearly not designed with real world use in mind, it has the worst resolution (reads 33lb in 1oz increments - all of the other scales read in 0.1oz, TEN TIMES higher resolution than the Escali), the Escali price tag was higher than the generic 30 and 35, and there were other problems with the Escali. This scale is sold under various brand names. It is made by two manufacturers in China, both of which make a similar product. This is a basic shipping scale with basic functions. It is a dual range scale that reads up to 30 pounds with accuracy of 0-2lb in 0.1oz and from 2lb to 30lb in 0.5oz. In KG mode this scale reads 0-1kg in 2g increments and 1kg - 14kg in 5g increments. The functions of this scale are quite basic; On/Off, Tare, 2 modes (Grams and Pounds:Ounces), a tray that has a built in tube holder (uses compression method) and that's about it! Our test of this scale showed it to perform not so great in regards to accuracy. We couldn't get the scale to read accurately lower than 0.5oz and in the higher range we experienced deviations of up to 1 oz. At 30lb the scale read 29lb 10.5oz. This scale is not recalibratable by the end user. The greatest thing about this scale is it's price, it's very cheap - unfortunately this shows in it's build quality. However the LCD display was large and easy to read. The LCD was also on a good angle for easy reading. The design of the scale is good, it's a nice size and very stable. The buttons are oddly placed on the side of the scale and have a low quality feel to them. This scale has been in the market for many years and there are some 25lb and 5lb older versions still in the marketplace. 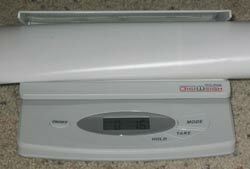 This scale is sold under various brand names but so far we have only seen it as Escali in the USA. It is made in China and is considered a 2004 model. This is a basic shipping scale with couple additional features. It is a single range scale that reads up to 33 pounds with readability of 1oz, In KG mode this scale reads 0-15kg in 5g increments, you can also put this scale in a strange "Ounce Only" mode where it will read up to 528ounces in 0.2oz increments. We say this is strange because above the standards of measurement dictate that above 16 ounces is a pound - meaning there is no such measurement as 17 ounces (it should be 1lb : 1oz according to all guidelines). The fact that this scale reads in this strange "ounce only" mode let us know that the manufacturer was not familiar with the standards of weighing and measurement. Even stranger is why does this scale read in 1oz increments in LB mode and 0.2oz increments in OZ mode? Perhaps the manufacturer was trying to cut costs and not use a 6-digit LCD, regardless it's extremely peculiar. This is what happens when a small trading company orders a "custom" scale from China. The result is often a bastardization of what a scale should be (forgive us but it upsets us to see such a silly mistake produced and sold to the public). The functions of this scale are basic but it also has a HOLD feature with a nice Beep sound; On/Off, Tare, 3 modes (Grams, Pounds:Ounces, and Ounces only). The tray of the scale has a built in tube holder (uses compression method). This tube holder is nicer than the Generic 30lb or 35lb scales, but the overall size of the Escali is cumbersome. These scales are designed to operate in an office, often on a desktop. The Escali lost points for being larger than the other scales tested and thus it took up the most room on our testing desktop. Another issue that we had with the Escali is that it was advertised as "reads in 0.1oz", however all 3 of our samples which we purchased from 2 of Kent Reed's stores (Digitalscalestore.com & Toplinedigitalscales.com) read in 0.2oz. This is a serious advertising error. 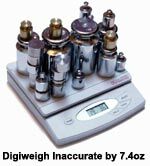 Our test of this scale had it perform within it's 1 ounce resolution except at higher ranges where it deviated by 6 ounces. When we put the scale in it's "ounce only" mode, we found it was surprisingly accurate at lower ranges. It had a readability of 0.2oz and accuracy of 0.2oz until we reached 5lb when slight deviations began to occur. At 30lb the scale read 29lb 10oz. This scale is not recalibratable by the end user. The greatest thing about the Escali is that it has a "Beep" sound. While other scales in our test also had a HOLD feature, Escali's scale makes a beep sound when the hold feature is used. The Escali LCD is bigger than the Digiweigh and it's on a good angle for reading. The operational buttons of the Escali are on the front of the scale and we found them very easy to understand and operate. This scale is sold under various brand names. It is made by a manufacturer in China known as "XCH Sensor" who has a reputation for making lower end products. This is another basic shipping scale with basic functions. It is a single range scale that reads up to 35 pounds with readability of 0.1oz In KG mode this scale reads 0-15kg in 3g increments. The scale manual clearly states readability of 0.1oz but precision of 0.2oz. The functions of this scale are basic but it also has a HOLD feature; On/Off, Tare, 2 modes (Grams and Pounds:Ounces), a tray that has a built in tube holder (uses compression method) and that's about it! "The Manual states precision of 0.2oz"
Our test of this scale showed it to perform not so great in regards to accuracy. We kept getting leftover values on the display when we would remove all weight (see the picture showing 0.1oz with nothing on it). Although the manual claims accuracy of 0.2oz we found accuracy to be closer to 1.5oz with strong deviations in the higher range (a 30lb true test weight weight showed as 30lb 6.6oz). Another minor problem with this scale was the stuck-on USPS rate chart. The chart is going to be out of date next month and will likely cause confusion and problems with consumers. The Digiweigh had the smallest LCD in our test, we found it difficult to read the LCD when compared to the much larger LCD's offered by the competition. Plus the Digiweigh LCD is on a flat angle - this makes it hard to read when parcels are on the tray. The Digiweigh reads in 3g increments - this is kind of strange: 3g, 6g, 9g,12g, etc.. Normally we'd expect a parcel scale to read in 1g, 2g, 5g or 10g increments as the other competitors do. Something we really liked about this scale was it's size. It was much thinner (flatter) than the other scales we tested. This is a newer entry to the market by My Weigh. It is made by My Weigh at their Fuzhou factory and is considered a 2004 model. 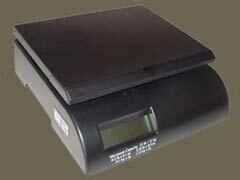 These are truly advanced shipping scales with many features. There are two Ultraship Models. The Ultra 30 reads up to 30 pounds with readability of 0.1oz up to 2 pounds and 0.2oz from 2 pounds to 30 pounds. The Ultra 50 reads up to 50 pounds with readability of 0.1oz up to 2 pounds and 0.5oz from 2 pounds to 50 pounds. In KG mode the Ultra 30 reads from 0-1kg in 2g increments and from 1-14kg increments in 5g increments. In KG mode the Ultra 50 reads from 0-1kg in 2g increments and from 1-22.5kg in 10g increments. The Ultraships also read in decimal pound mode and also gram mode. Decimal pound mode is very important for shipping because many shipping and courier companies charge by portion of pounds. This means if your box weighs 15.505lb you need to know it weighs 15.505lb - not 15lb : 8.1oz! We are very surprised that only the Ultraship reads in true decimal pounds mode. All other major brand shipping scales also read in decimal pounds (Ohaus ES series, Detecto AS series, Acculab SV series, etc..). Our test of this scale showed it to perform within 0.1oz at the lower range and 0.4oz at the higher range (1.0oz on the Ultra 50). We were able to obtain better results after recalibration when the scale performed within it's specifications throughout the weighing spectrum. Note that while recalibration is very simple, you must have access to calibration weights. If you ever need to recalibrate a scale and you don't have weights, visit your local full-line scale dealer. They will often recalibrate your scale for free. The UltraShip has the following accessories and features: Removable detachable faceplate for remote readings, mailing tube cradle, envelope & large envelope holder, hold feature, tare feature, adjustable auto-off, and it reads in 4 modes. Our favorite feature was the detachable faceplate - this made this compact scale expand into a much larger scale where we could easily read the weight of large box. Another great feature is the adjustable auto-off - when using a shipping scale all day in an office or warehouse it's important that you are able to disable any auto-off features, otherwise you'll find yourself constantly turning the scale back ON and having to wait for it to power up before use. The other built in accessories were truly innovative, the Mail Tube cradle is much more useful than the pop-up covers found on the other 3 scales and the large envelope holder will definitely come in useful in most offices. Last but not least, the Ultraship is the only scale we tested that reads in decimal pounds. The only complaint we have about the Ultraship is that it's a bit tricky to release the detachable faceplate, it could be improved with an easier mechanism. 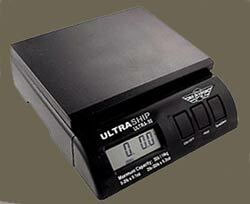 We feel that overall the Ultraship is the best shipping scale we tested. 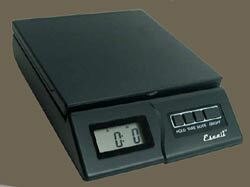 $44.90 is very little to pay for a well designed scale with a lifetime warranty. 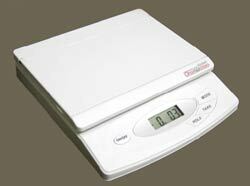 However if you are very price conscious and $10 is important to your decision, purchase one of the various Generic 30lb scales in the market. Please note - most American consumers need a scale to read in decimal Pounds (eg 20.505lb); only the Ultraship reads in decimal pounds. We encourage you to provide feedback on this article and/or tell us your personal experience with a scale. Important Disclaimer: Scales are sometimes difficult to compare. Our results are just a sample of tests done at random conditions. The actual operating conditions of your scale may vary from our test conditions and your results may differ from our results. We did our best to test the scales in a blind and unbiased manner. We receive advertising consideration from companies that advertise on and support this site. We do our best to not allow this to affect the results of our tests and evaluations. However, we strongly recommend that you do your own comparison tests in your actual operating environment to determine which scale is best for your needs. The terms Digiweigh, Escali, My Weigh, Ohaus, Acculab, AND and all are trademarks or trade names of their respective parties. Names are used for comparison purposes only and for the purposes of this article. No other rights are expressed or implied. This article and all images therein are © 2004 Scale Magazine.com.